It’s been an inspiring week with Kim Klassen, who over the last few weeks has been talking about her wonderful inspirational week away with the group ‘shutter sisters’. Her sisterhood bonds and her dreams. Today’s photo was taken by my niece when she visited Floriade Australia’s Spring festival. Just beautiful coloured tulips, and the curly petals I love…I called it ‘Dancing Tulips’. A photographer in the making…the texture ‘phobe’ was also inspired by one of Kim’s friends daughters…only fitting to join the two. Pretty tulips, Yvette…I don’t see many with the ruffled edges. Your niece is taking after her aunt with the photographic ‘Midas Touch’. They are lovely, and the color is so lively. A gorgeous tulip beautifully shot. Springtime! Appropriately titled – this is lovely! 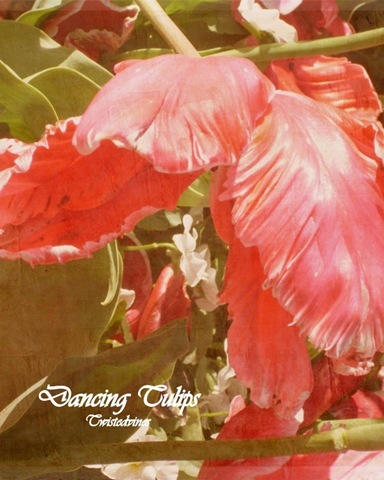 Dancing tulips is very apt and so beautiful Yvette. “dancing tulips” is a perfect title for this beautiful photo! I love tulips – one of my favourite flowers! Beautiful photo and application of texture. I love those frilly tulips!